Niners fans may miss the cold weather at Candlestick (OK, maybe not all of them will), but, in addition to Santa Clara's balmier weather, fans can look forward to solar panels, bicycle parking and a native plant garden. Levi's Stadium — the 49ers' new home in Santa Clara — is being touted as the greenest stadium in the NFL. The $1.3 billion project is almost complete. 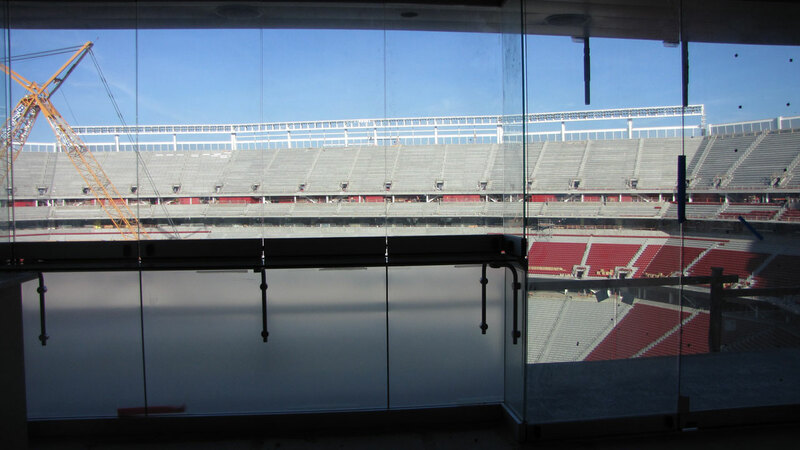 The day I visited, construction workers were installing interiors in the suites (those are inside the large glassy rectangle in the photo above) and putting seats in the stands. 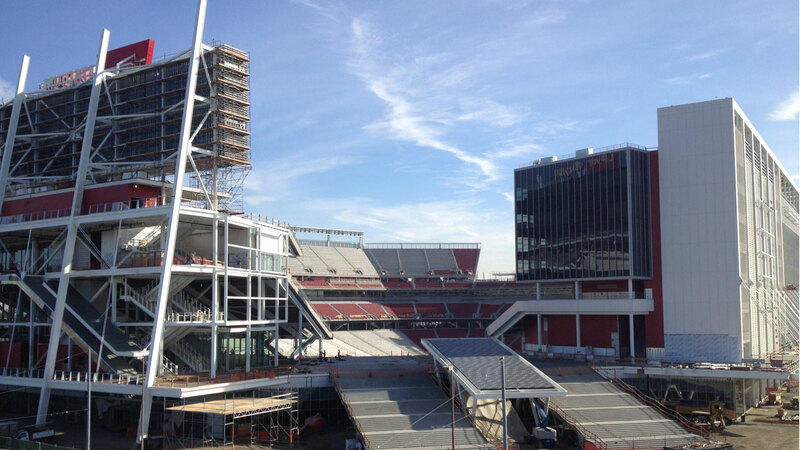 A big "Levi's Stadium" sign was already up over one of the giant video boards. 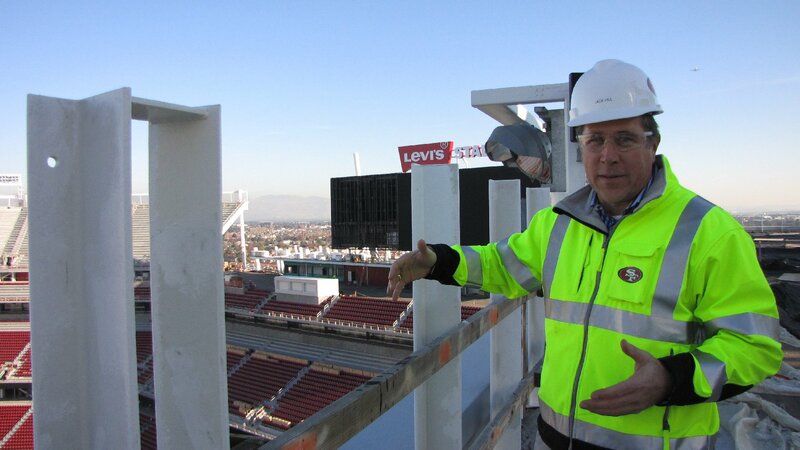 Levi’s Stadium project executive Jack Hill showed me around the stadium, starting at the top. From the roof above the stadium’s suites (what Hill calls the suite tower) we had a view of San Francisco Bay on one side and the coastal hills on the other. "We love coming up here. It's kind of fun to see the progress on the stadium," he said. "I tell everybody I've got the coolest job in the world." Solar photovoltaic panels are installed here on the roof and on pedestrian bridges connecting the parking lot to the park. 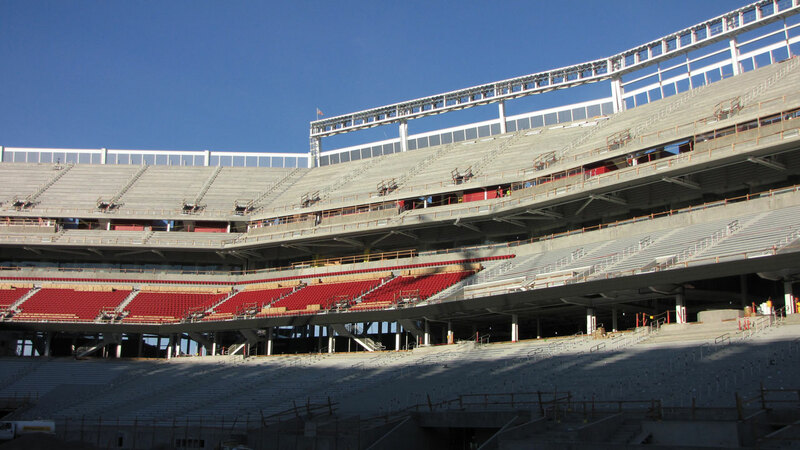 In total, there will be about 20,000 square feet of panels, enough to stretch from the end zone to the 50-yard line. They won’t provide all the electricity to run the stadium — actually only a small percentage of it — but by generating power all year, they'll offset what's used for up to 10 game days, according to team officials. Hill says, on average, a football game uses 3.5 to four megawatts, about as much power as 3,000 homes. There are other football stadiums with more solar panels, in Philadelphia and Washington D.C., for instance. But there's one thing on the roof Hill is fairly sure no other team has yet. 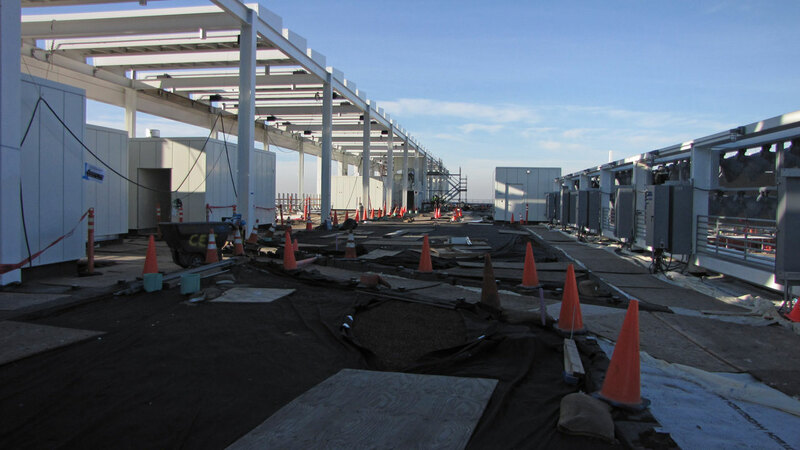 "The area that you see with all the black tarps over it, with the dirt underneath it, that’s our green roof," he said. It will be a native plant garden. Hill, who oversaw construction of the Dallas Cowboys' new stadium, says he’s used to dealing with landscaping. (The point of all this, let’s not forget, is the football field.) But a rooftop garden takes some different thinking. "We want something that's full, something that's fairly low," he said. "Something that's easy to maintain. Something that doesn't require a lot of water. And something that's pretty." Also, nothing with the colors of a rival team, like the Cowboys. "We avoid blue and silver, and I guess we’re gonna have to start avoiding green and blue, from the Seahawks." The garden and the field will be watered with recycled water, supplied by a nearby wastewater treatment plant. Hill took me down to field level to show me the pipes. "This is like a little city down here. You have to maintain the field, you have to maintain all the electrical, plumbing," he said. "You see the purple pipe? That’s all recycled water." The toilets in this stadium are low-flow, and they'll use the recycled water, too. Other environmental measures include recycling most of the construction debris and using highly efficient LEDs for about 40 percent of the lights. Levi’s Stadium is on track to earn a gold certification from the U.S. Green Building Council, the second-highest rating possible. It would be the first new pro-football stadium to earn LEED gold. It’s not just what’s inside the stadium that makes it green. The team is encouraging more environmentally-friendly transportation to and from the games, as well. "Most of the traditional arrangement is a stadium with a sea of asphalt around it and everybody parks right around the stadium," said Kevin Riley, the director of planning and inspection for the city of Santa Clara. We were standing across the street from the stadium, which still has a fair amount of asphalt around it, though fewer dedicated parking spaces than most stadiums have. There are train tracks, too; the VTA, which connects to CalTrain, stops here and there’s an Amtrak stop nearby. There’s also bike parking, which opens up the possibility of bicycle tailgating. As for cars, Riley explained, to keep the stadium’s footprint smaller, it’s the team’s job to rent parking from nearby technology companies. "The goal always was, go out there and beat the bushes, find the guys who are willing to make some money off of selling parking spaces," he told me. But that hasn't been totally successful: the 49ers haven’t found enough parking for Monday or Thursday night games, when fans would be pulling in before businesses close. So next season, home games will be only on Sundays. Opponents of the stadium have expressed concerns about traffic and parking. A green NFL stadium sets a good example, said David Lehrer of the Center for the Built Environment at the University of California, Berkeley’s. But he pointed out that being environmentally-friendly doesn't just mean building green. "You go to one of these events, when you walk out it's littered with all kinds of garbage," he said. Santa Clara will have recycling at the stadium, and Riley said they're looking into composting. Bu there's the larger issue, Lehrer pointed out, of whether the stadium will be used enough to make up for all the energy that's going into building it. "I think the important thing is that people are building buildings and structures and spaces that are going to be used for a long time," he said. Candlestick, which opened in 1960, is one of the oldest parks in the NFL. Stadiums like nearly-90-year-old Soldier Field in Chicago are a rarity, because teams make money on new stadiums by selling fancy seats, ad space and naming rights. So the best scenario for the 49ers' green legacy could be for the team to play well and for the fans to keep coming, making it worth it for the Niners to stick around. "You know, at the end of the day, there’s going to be between 65– and 70,00 people that are going to sit in a seat, order a hotdog, go to the restroom, and enjoy the entertainment on the field," Hill said. Levi’s Stadium's first event will be in August 2014, when San Jose's pro-soccer team the Earthquakes break in the field. The Niners pick it up that fall. 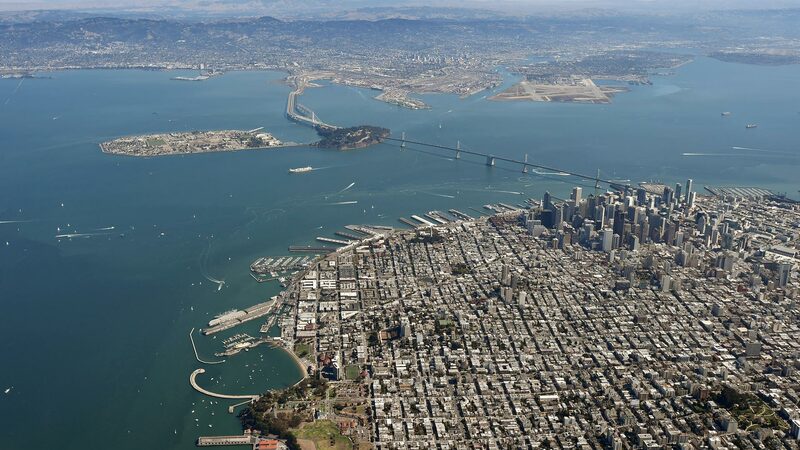 And Santa Clara will host the Super Bowl in 2016.